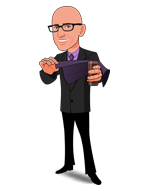 Today, when you order "SWITCH - Unfolding The $100 Bill Change by John Lovick - Book", you'll instantly be emailed a Penguin Magic gift certificate. You can spend it on anything you like at Penguin, just like cash. Just complete your order as normal, and within seconds you'll get an email with your gift certificate. Order in the next 6 hours 60 minutes and it will ship TODAY! As for the material goes, the stuff really varies. I found that I might not actually perform most of the stuff, but I will definitely take account a lot of it. I might work on some things and change them up to fit my personal preference, and you might too. There are a ton of great subtelties that I never considered before. Some stuff that you see but never realise before is in here too. Like how to hold a bill the right way, how to turn it the right way, how to hide it etc. The teaching in here was pretty top notch. It was simply laid out into 2 columns per page which made it look a lot nicer to read and sort of inspires you to read it all. John is a great teacher and everything is in as much detail as you need. All in all, I highly recommend this book to anybody hoping to start in bill magic. There is a TON of excellent material in here that I'm sure you will love as much as I did. It was a fun read and a really smooth read. Good book albeit largely repetitive. A worthy study if you are new to bill switching, however, it is far from complete. There are dozens and dozens of bill switch presentations that aren't in the book, including my three favorites, but there are plenty of variations (including a bunch by Gregory Wilson) to keep you busy. Often an incredibly boring read, but a good resource none the less. I LOVE this book! When I first saw it, I couldn't believe such a large book had been dedicated to "one" trick. After reading a glowing review shortly after it was published, I figured it was worth a look; since I had a bill switch in my show and figured it could only improve. Now this is one of my favorite magic books in my library! Nothing is left out of this book! History, routines and various means of performing the bill switch are all in this book - and more! This isn't just a magic book you can use as reference for handling and routines. This is an interesting read from cover to cover! Think you know the bill switch?! Think again! Whether you've been performing it for years or are thinking of performing it in any capacity - this book is for you! All I have to say is this: If you don't own this book yet, there is seriously something wrong with you. Not only is this a compendium of bill change/switches by the best magicians like Klause, Kozlowski and Ammar but tips on thumb tip use, the History of the creator of the trick Vladimirov, torn and restore, routines, handling, and techniques. This is a very exhausting and packed book of over 300 pages. The instructions are easy and the art work amazing, better than the latter magicians books on the trick. Over a hundred magicians included here as well with over a hundred or so tricks. And it has what other books don't have: an INDEX. This book is worth way more than the price they sell it for. In my magic man-cave, on my magic man-cave shelf, I have this book. This book is right next to my complete Tarbell Course in Magic book. The Switch is extremely well-written, and I consult it before I do a show, or show someone 'how' I can change one denomination to another, I consult this book. There is nothing better than 'showing' someone how to double their money...but I consult it, so I don't show someone the same switch twice. I started magic with cards and now getting into coins. Therefore I had no knowledge whatsoever on Bill Switch before getting the book. However even for a newbie like me, after reading it, it has been easy to follow with detailed descriptions and clear illustrations. It has been a pleasant reading so far. 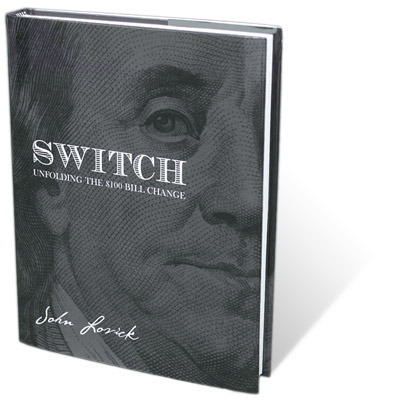 Everything you need about Bill Switch are written in the book. History, Thought-provoking theories, Different Handling (W/ or W/O TT) and Variations, Loads and Steals, etc., and the list goes on. There are too much content for $37! : ) Thank you PENGUINMAGIC for the generosity. 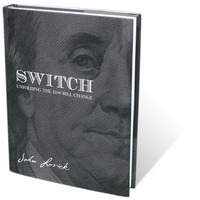 If you want to thoroughly study Bill Switch, this book should be on your shelf. Although I am sure there are other eye-opening switches, this is a true gem that stands out in the realm of Bill Switch. You just cannot go wrong with this book. I just cannot stop saying good things. As you can see, I am madly in love with this book.